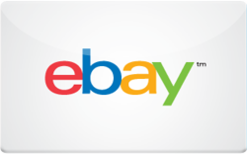 Buy a discounted eBay gift card to save on any eBay purchases. Giftcards will work like cash and can be used in conjunction with coupon promo codes. These will never expire. Valid only for purchases on eBay where PayPal is accepted. A maximum of $500 in gift cards can be redeemed per order. There is a redemption limit of $500 in gift cards per 30 days for unverified PayPal accounts and $5,000 in gift cards per 180 days for verified PayPal accounts.